"If you are here from a distant land, a late spectator for whom this was the first day of the sacred show, let not the naval warfare deceive you with its ships, and the water like the sea: here but lately was land. You don't believe it? Watch while the waters weary Mars. 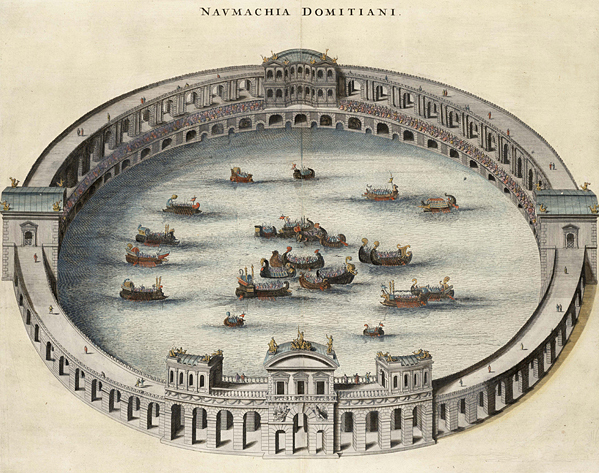 But a short while hence you will be saying: 'Here but lately was sea'"
The popular imagination is fascinated by the possibility of a naumachia in the Flavian Amphitheater (Colosseum). Suetonius records its inaugural being celebrated by Titus with a naumachia in the old basin of Augustus (Suetonius, VII.3). But it is Cassius Dio, writing a century later, who speaks of one actually in the arena of the amphitheater itself. "For Titus suddenly filled this same theatre with water and brought in horses and bulls and some other domesticated animals that had been taught to behave in the liquid element just as on land [the water therefore must have not been too deep for them to perform]. He also brought in people on ships, who engaged in a sea-fight there, impersonating the Corcyreans and Corinthians" (LXVI.25.2-4; the battle, which precipitated the Peloponnesian War, took place in 434 BC; Thucydides, I.1.29). Martial, too, commemorates the display in what presumably is an eye-witness account, and certainly the image of the Colosseum arena being flooded is evocative. But, assuming that the spectacles occurred there and have not been confused with the naumachia Augusti, which would have taken too long to fill and likely never was drained, one wonders how it might have been accomplished. The arena of the Colosseum is an ellipse measuring 86 by 54 meters, which is close to what was considered an ideal ratio of 5:3 (the naumachia of Augustus had a ratio of 3:2). Surprisingly, the length and width differ and Richardson's figures are used here. If the depth was 1.5 meters (approximately five feet, which is sufficient for the draft of ships and yet not so deep that those in the water would drown—unless that was the intention for men who were condemned to die, in which case the water would have been slightly deeper), the volume necessary to flood such a space would be about 5471 cubic meters (m3) of water, which would have been piped from the Arcus Neroniani, a branch of the Aqua Claudia that also supplied water to the nearby Temple of Divine Claudius (Frontinus, LXXII), the Palatine Hill, and before the Colosseum was built, the lake of Nero's Domus Aurea (Suetonius, XXXI; Martial, II). Crapper, who has done one of the few hydraulic studies of the Colosseum, indicates the flow of the Claudian aqueduct to be 2.12 m3 per second, although this volume would have been reduced by half by the time it was piped from the distribution tank (castella) on the Caelian Hill and distributed through the network of pipes, channels, and drop-shafts of the amphitheater. Using a smaller circumference for the arena (80 by 45 meters), he has calculated (in a later correction to his original article) that the arena of the Colosseum (4241 m3) could be filled in approximately thirty-four to seventy-six minutes, depending upon where flow was measured and assuming that all the water was dedicated to that purpose. To the spectators, this certainly must have seemed as if Titus "suddenly filled this same theatre with water" (Dio, LXVI.25.2). Frontinus, who was appointed curator of aqueducts by Nerva in AD 97, remarks that the Aqua Claudia discharged 4607 quinariae at its intake, the figure presumably used by Crapper in his calculations, although the flow rate actually would be 2.21 m3/sec if one assumes a quinaria to be 0.00048 m3/sec. The arena measured by Richardson would flood in eighty-three minutes (again assuming that the flow rate in the amphitheater was half that of the aqueduct itself). But Frontinus notes that the Aqua Claudia was especially prone to water theft and fraud, "since the amount actually delivered does not agree either with the statements of the records [2855 quinariae] or with the gauging made by us at the intake , or even with those made at the settling-basins , after so many depredations" (II.72). Given these unauthorized losses, only 1750 quinariae (0.84 m3/sec) seems to have been delivered. If all the water were channeled to the Colosseum and not, for instance, to the emperor's own residence on the Palatine Hill, this reduced flow would have increased the time to fill the arena to about three-and-half hours. A complex hydraulic system did supply water to the Colosseum for drinking and to flush away waste. Channels in the hypogeum also could have drained rainwater funneling down from the seats, which, given the surface area of the amphitheater, could be as much as 0.75 m3/sec during a heavy rainfall. These conduits do seem to be greater in number and size than necessary simply to manage the flow of rainwater, but there is no surviving archaeological evidence for a link from the Caelian to the Colosseum, nor is there clear evidence how such a volume of water was managed. When Titus suddenly died in AD 81, he was succeeded by his younger brother Domitian, who "even gave a naval battle in the amphitheatre" (Suetonius, IV.1; about AD 85). Domitian also constructed the hypogeum below the floor of the Colosseum, a substructure of cells, passageways, and lifts almost twenty feet deep (cf. Herodian, who marvels "when a hundred lions appeared in one group as if from beneath the earth," History of the Empire, I.15.6). 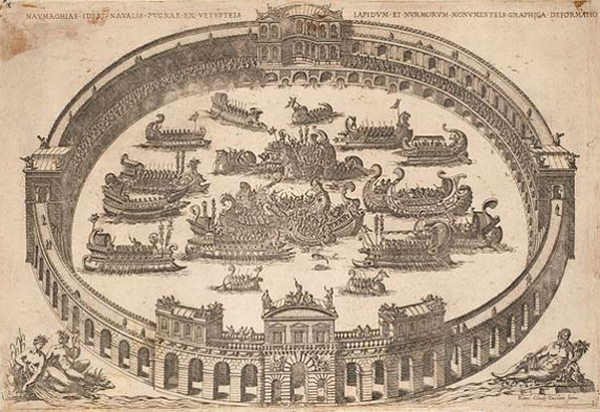 Suetonius records that the emperor later presented naumachiae "almost with regular fleets, having dug a pool near the Tiber and surrounded it with seats; and he continued to witness the contests amid heavy rains" (IV.2). Dio expands on the account, indicating that the display was part of triumphal celebrations (after his victory in Dacia in AD 86). Practically all of the combatants perished (as was the intention) but also many spectators when a violent rainstorm came up and no-one was allowed to leave. Domitian, himself, put on thick woolen cloaks, but others were not permitted to change. As a result, many sickened and died (LXVII.8.2-4). Suetonius speaks of this basin again, saying that the stone used in its construction was later used in rebuilding the Circus Maximus, which had been destroyed by fire (V). As part of the dedication of the Colosseum, the myth of Hero swimming to Leander under cover of darkness and Nereids presenting an aquatic pantomime were re-enacted (Martial, XXV, XXVb, XXVI), displays that could have taken place either there or in the naumachia of Augustus. Although it is possible that the venues have been conflated, Suetonius and Dio both are explicit in recording that naumachiae also occurred in the Colosseum. It may be, therefore, that, before the hypogeum was constructed (or restructured) by Domitian, there was a simple, more shallow basin, any trace of which would have disappeared when the space beneath the arena floor was converted. The ships, too, would have been smaller scale replicas, which explains why there were naumachiae elsewhere, "almost with regular fleets." After the hypogeum was installed, such naumachiae no longer would have been possible (certainly, they would not have been practical), and none are recorded. The hand-colored Dutch engraving (1663) from the Netherlands Maritime Museum (top) is based upon an etching by Étienne du Pérac that was commissioned by the Veronese scholar Onofrio Panvinio for his book De Ludis. Based upon measurements and details provided by the author, the copper plate was etched between 1565-1566 and is almost identical to one du Pérac later produced for a catalog of engravings by Antonio Lafréry on ancient Rome. This book was published in 1600, a second edition of which is in the collection of the Canadian Centre for Architecture, from which the engraving above has been taken. References: "Launching into History: Aquatic Displays in the Early Empire" (1993) by K. M. Coleman, The Journal of Roman Studies, 83, 48-74; "How Roman Engineers Could Have Flooded the Colosseum" (2007) by Martin Crapper, Proceedings of the Institution of Civil Engineers, 160(4), 184-191 (correction: 2008, 161, 14-15); The Colosseum (2000) by Filippo Coarelli, Gian Luca Gregori, Leonardo Lombardi, Silvia Orlandi, Rossella Rea, and Cinzia Vismara; A New Topographical Dictionary of Ancient Rome (1992) by L. Richardson, Jr.; Martial: Epigrams (1993) translated by D. R. Shackleton Bailey (Loeb Classical Library).